Update: Further investigations are beginning to point to the possibility of an underwater volcanic hill based on more recent scans. More information should come to the surface. Some believe this new explanation may be a coverup, but that position remains speculation at this point. Portuguese news reported the discovery of a very large underwater pyramid, first discovered by Diocleciano Silva, between the islands of São Miguel and Terceira in the Azores of Portugal. According to claims, the structure is perfectly squared and oriented by the cardinal points. Current estimates obtained using GPS digital technology put the height at 60 meters with a base of 8,000 square meters. The Portuguese Hydrographic Institute of the Navy currently has the job of analyzing the data to determine whether or not the structure is man-made. 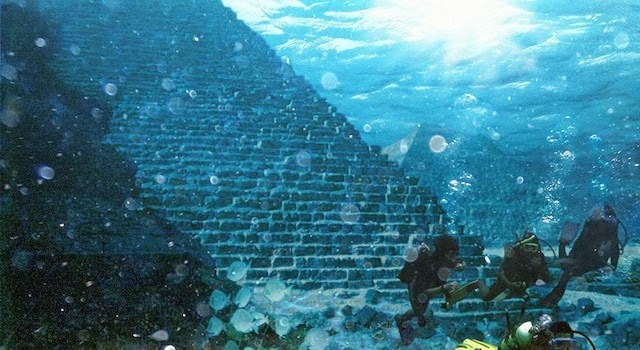 The pyramid was found in an area of the mid-Atlantic that has been underwater for about 20,000 years. Considering this is around the time of the last ice age where glaciation was melting from its peak 2,000 years prior, whatever civilization, human or not, that was around before the ice age could be responsible for building the pyramid. While the Portuguese Navy still hasn’t determined its origins, many might question why this wasn’t reported on sooner than late 2012. Certainly the NOAA, who studies volcanic activity in the area of the pyramid, would have discovered it through sonar imaging and so forth, as the area is heavily studied due to volcanic activity. Either the NOAA hasn’t yet come across it, they are hiding what they have found, or the pyramid doesn’t exist. The last theory does not seem to be likely given the authenticity of the find. Archeologists from the Portuguese Association of Archaeological Research have recently discovered evidence on Pico island pointing to the existence of humans in the Azores region before the arrival of the Portuguese thousands of years ago, further supporting the notion that this pyramid could have been built by different civilizations. As of today, there is still no explanation for who created the rock art found on the islands. Was the pyramid built by whatever civilization existed prior to the Portuguese? Is it possibly not even man-made? Here is the Portuguese news report with English subtitles for those who wish to look into the authenticity of the claims. The Azores are an interesting region, comprising a chain of nine volcanic islands in three main groups that are roughly 930 miles west of Lisbon. They are all situated around the fault lines between the North American, Eurasian, and African tectonic plates – an interesting place to have a pyramid given the energetic qualities often associated with pyramids.This video explores the authenticity of the story and the possible location visually using some maps. It is important to note that exact coordinates of the pyramid have not been released. It is believed that there may be a discovery of 2 more pyramids in the area, as images suggest there could be a design link to that of the pyramids built in Egypt. Is this the sunken continent of Atlantis?